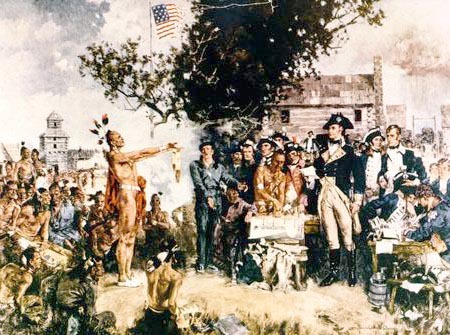 Difference between revisions of "Ojibwa Indians"
The Signing of the Treaty of Greeneville (1795), as depicted by painter Howard Chandler Christy (1945). General Anthony Wayne dictates terms to the American Indians. This painting is currently hanging in the rotunda of the Ohio Statehouse. The Ojibwa, also known as the Chippewa, lived mainly in Michigan, Wisconsin, Minnesota, North Dakota, and Ontario, Canada at the time of European contact. They are a part of the Anishnaabe band of the Algonquian language-speaking peoples. The Ojibwa were closely related to the Ottawa and Potawatomi nations. They were sustained through hunting, fishing, and some agriculture. The Ojibwa participated in the fur trade with French merchants; and the two groups often intermarried. Ojibwa warriors fought with the French against the British in the French and Indian War. Following France’s defeat, the Ojibwa assisted Pontiac in Pontiac’s Rebellion. Pontiac was a chief of the Ottawa, but his mother was Ojibwa. During the American Revolution, the Ojibwa allied themselves with the British. They feared colonial settlers would continue to move into American Indian land if they did not receive assistance from the British. General Anthony Wayne defeated the Ojibwa, who fought alongside the American Indians of the Ohio Country at the Battle of Fallen Timbers (1794). They gave up their claim to lands in Ohio with the signing of several treaties, including the Treaty of Fort Harmar (1789), the Treaty of Greeneville (1795), the Treaty of Fort Industry (1805), and the Treaty of the Maumee Rapids (1817). Despite a strong removal policy towards most American Indian groups East of the Mississippi, the United States government did not force a majority of the Ojibwa off of their land. Rather, the Ojibwa lost some of their territory in Michigan, Wisconsin, Minnesota, and North Dakota. They later regained some of this Midwestern territory as reservations. Historically, the Ojibwa nation was considered to contain fifteen discreet bands. Today, the Ojibwa nation is represented by numerous federally-recognized tribes across the U.S. and Canada. In 2005, approximately 176,000 Ojibwa resided in North America.